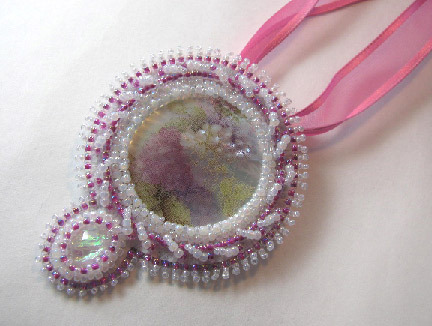 Beading Arts: Lilac button pendant...fresh for summer! I bought this beautiful mother-of-pearl button the last time I was out in Portland OR, visiting my daughter. You can probably find something similar to it online. I would recommend a Czech glass button as an alternative. 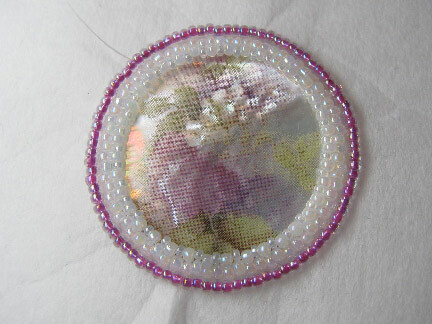 Because the button is so beautiful, I wanted to keep the bead embroidery around it fairly simple so that it wouldn't compete. For that reason also, I chose seed bead colors that matched the button colors. The shank is fairly shallow, so I didn't have to worry about cutting it off. 1. 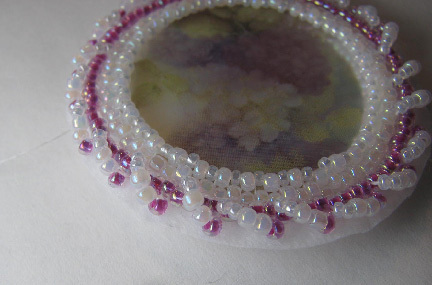 Using white interfacing as the foundation material, I stitched on the button and surrounded it with two rows of back stitch in size 11/0 seed beads. I was able to get the outer row to be a multiple of four, which gives me the greatest number of options for finishing it off with a decorative stitch. 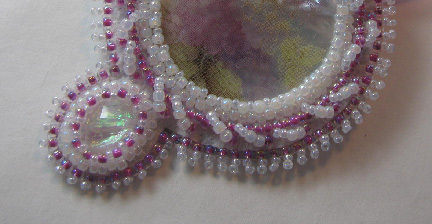 Using the inner row as a base, I added two rounds of peyote stitch to create a bezel. The first row is also size 11/0 seed beads, and the final row is size 15/0 to help cinch it in and cover the edge of the button. 2. Using the outer row as a base, I added one row of Russian spiral stitch, still in the same colors. Instructions for bead embroidered Russian spiral can be found in Bored By Back Stitch, chapter one. 4. Add a square stitch bail to the back of the pendant. Very pretty and so delicate!!!! Lovely - and to think you started with a button!